In the dead of winter, it’s pretty easy to get tired of your wardrobe. Winter is dragging on, outside it’s cloudy and grey, and you’ve been wearing your cold weather clothes for months. But spring is still weeks away, so how can you inject some life into what you’re wearing every day? With color! And I’m not just talking about adding one dramatic pop of color to your look today – how you pair colors also has a big impact on the liveliness, effervescence and joy you find in your outfits. Many clients that I work with already have a good amount of color in their closets, but they’re a bit reticent about combining colors in new and different ways. So, if you’re ready to try some color pairings that you may not have thought of before, check out 10 color combinations that always work, and will keep you looking stylishly cool (and hot!) no matter how dreary the weather. Navy and orange are a traditionally nautical combo, but when you combine them with modern shapes, they create a big impact. And one way to exponentially increase the impact is with bold, solid blocks of color – an orange trench over navy separates or a dark blue dress accented with orange booties feels current, stylish and fun. Burgundy has become a fall/winter neutral, so it’s time to wear it with something unexpected, like blush. Blush might feel a little spring-like, but with burgundy it creates a sophisticated statement (click here for other uncommon burgundy color combos). If you’re nervous about wearing two colors in one outfit, you can decrease the intensity of one (or both) with texture. Lace, eyelet, tweed, etc. add shadows into the fabric and can tone it down to a level that you’re more comfortable with. 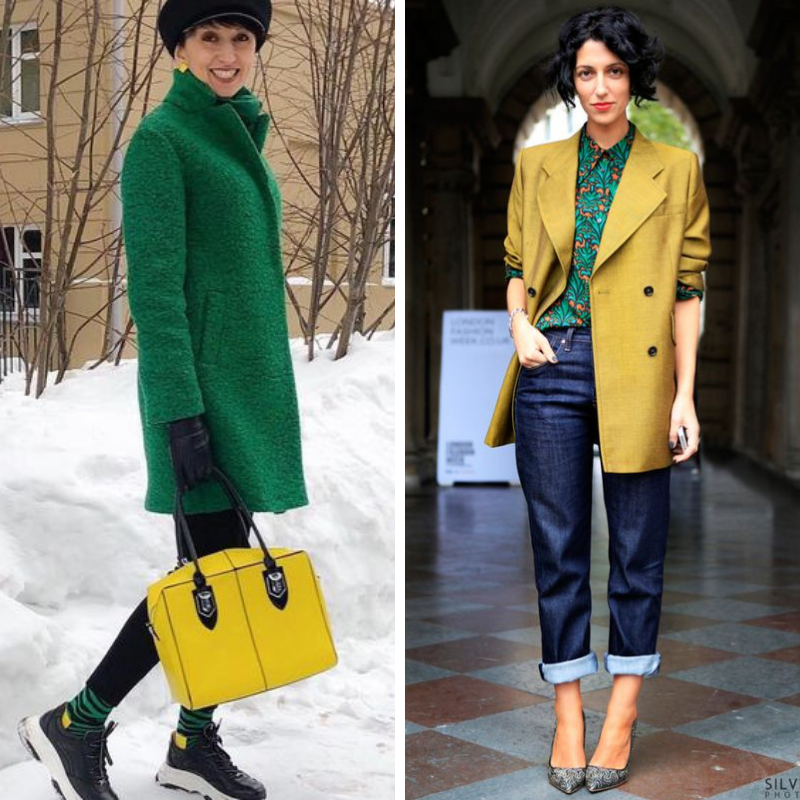 When you want to be seen, adding yellow and green is a great way to do it! And if you don’t have both yellow and green items hanging in your closet, never forget that accessories can be just as dynamic in adding vitality to your outfits. Check out this blog post for 3 outfits that go from safe to stunning with a simple change of accessories. When I bring up blue and pink, you may think of a gender reveal party – but don’t! I’m not talking about baby blue and pale pink – the combo I love is medium to dark blues worn with shades of hot pink. The great thing about these colors is that you can select specific tones based on your preference – you really can’t go wrong. 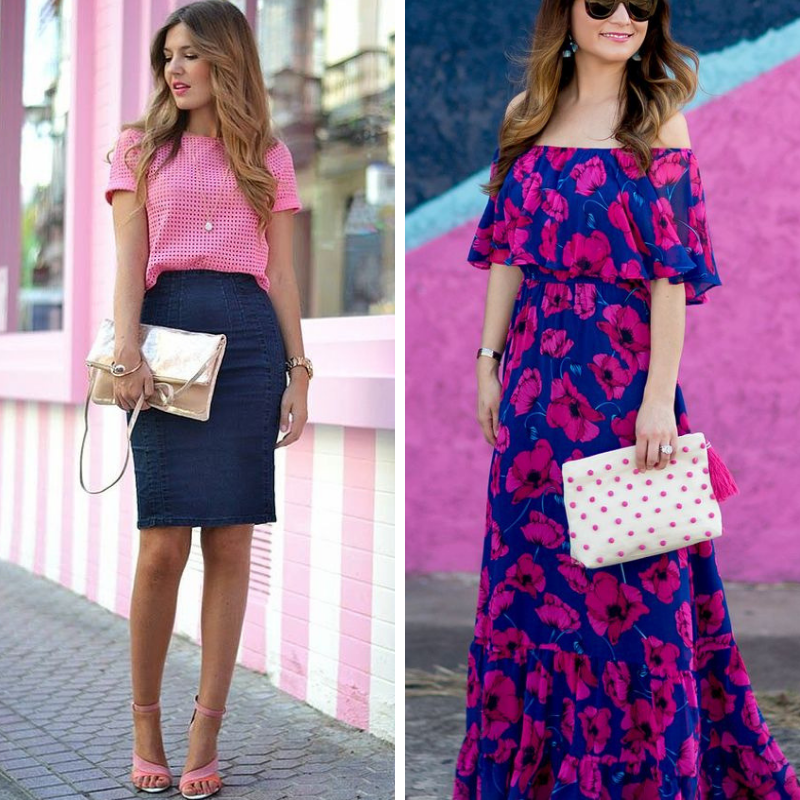 And if you’re not confident in your combination, find prints that combine the colors you like. The hard work is already done for you, and then you can choose accents that play up the pairing. When you’re looking to play with a cooler combo, I’ll always turn to teals and blues and greens. They reflect shades of the ocean, of grass and sky, and feel contemporary and street-wise when worn together. Combining colors isn’t always about pairing strong and intense shades – you can create a completely smart and chic combo with a neutral base and a bright accent. Grey with yellow is a duo that I return to often, especially for clients that prefer grey, but are willing to try a ‘pop’. For ideas on incorporating a pop color into your wardrobe, read this. Camel and black is a timeless coupling that always feels right. Yes, it’s not as ‘in-your-face’ as some other combinations, but if you’re looking for subtle yet refined look, this is it. And if you need to add some pizazz, how about wearing a cheetah or leopard print? Are you concerned about wearing shades of brown and black together? Then click here to read why it works. White does amazing things for all colors. It multiplies the intensity of any shade and makes it stand out that much more. 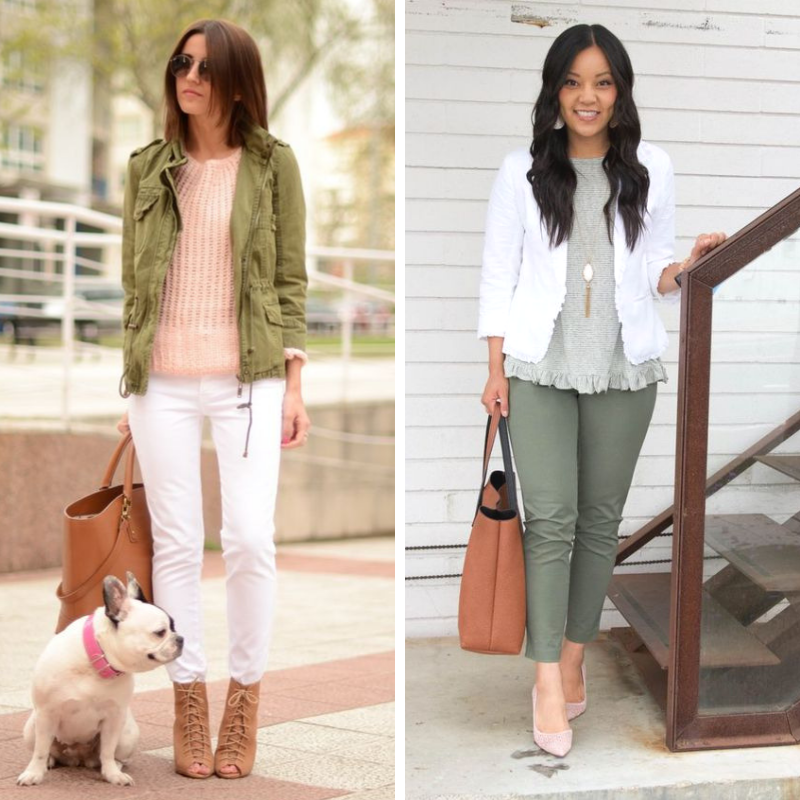 In summer, white amplifies brights – but in cooler weather, I love what it does to olive. It’s a smart and clean combo that you can take from work to weekend and back. Monochromatic dressing can feel altogether stylish or plain and boring – it’s all about how you put it together. An ideal way to add interest is by playing with shades of the same color – in this case, shades of grey. Pulling pale greys, medium tones and charcoals into a look is one of my all-time favorite ways to feel quietly sophisticated yet supremely stylish in a laid-back and relaxed manner. When you’re going for a tonal grey look, don’t forget about print and texture – they add needed dimension whether you’re wearing a tweedy coat or snake print boots. What color combo will you try this week?